Founded by the Romans as an administrative center, London has had 2000 years of history. Throughout these two millennia the city has almost continuously developed as a trade mart, stronghold, center of government and, increasingly after 1300 or so, as the driving wheel (or monstrous, all-consuming, all-poisoning “great wen”) of England and later of Great Britain. 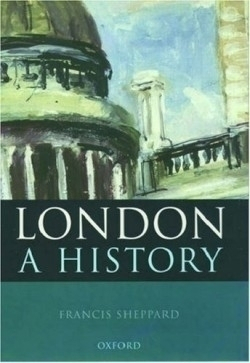 Francis Sheppard, the acknowledged dean of London’s historians, has distilled these two millennia of urban, administrative, economic and social history human into a concise, detailed yet accessible 360 pages of narrative —a major feat. Cities of ancient foundation develop organically and erratically; they are not rolled out on the drawing board as were modern cities such as New Delhi, Chandigarh and Brasilia. Sheppard captures London’s complexities, skillfully presenting the many competing forces that shaped the city’s growth. In early London (through c. 1500), the church, wealthy merchants and aristocratic families as well as the crown staked out territory and sought power. The king and his personally run administrative and judicial machinery were often on the road, particularly in times of civil war or campaigns against the Scots. By 1200, London, a vital source of finance for royal ventures, had won and was able to maintain a substantial degree of freedom (in practical if not theoretical terms) from royal governance, shaping its own growth. Sheppard notes the liberating force of the Reformation; the destruction of London’s abbeys and monasteries and the secularization of society became catalysts to rapid and unregulated growth. As a wealthy and self-governing entity on the front lines of national defense (the Thames being the great entry way to the heart of the wealthy South), London was an economically powerful and politically aware, a center vital to both Cromwell’s success in the Civil War and to William of Orange’s success in the Great Revolution. Trade and its associated finance were overwhelmingly concentrated in the capital—and money fed military strength. The author provides a very engaging account of vibrant 18th-century London. The city experienced an unparalleled rise in prosperity and a concomitant advance in the arts, including that of refined living for the monied classes. Swift, Handel, Garrick, Fielding, Hogarth and Samuel Johnson were among the luminaries of the day, and their work reflects the city’s cultural vitality. By the nineteenth century, however, density of population and the continuing growth of manufacturing made London life increasingly challenging. Sheppard records this growth and change with masterful skill, his concise, carefully focused chapters conveying detailed but crystal-clear information. He notes that though London was a world city of immense commercial wealth and power by 1900, the newer industrial cities of the North—Manchester and Liverpool in particular—were forces to be reckoned with. Today, in the new Britain, part of the new Europe, London may be in eclipse as so much wealth creation and so many economic functions are decentralized. Sheppard amply supplies vivid “how they lived” information, with diet, housing, health, consumer goods, education, arts and culture, recreation, religion, transportation, pollution, urban planning, crime and justice getting continuing coverage. With 29 maps, 58 plates, notes, extensive bibliography and analytical index, London is a fine, well balanced account of a great city’s history, with the added advantage of bringing the record up to the present. It should be a priority purchase for libraries and will be a rewarding one for individuals.